Two recent bodies of large-scale photographs by internationally recognized artist Laurie Simmons are featured in this exhibition. Two Boys and The Love Doll continues Simmons’ longstanding use of the doll figure to explore issues of gender, feminism and domesticity. She has been affiliated with the Picture Generation – artists from the 1970s who appropriated mass media and commercial advertising to respond to a shifting cultural American landscape. Since the mid ’70s, Simmons has used dolls, ventriloquist dummies, mannequins and occasionally people to create images with intensely psychological subtexts. In the photo group, Two Boys – a vision of the internal and communal traumas of the Internet – she uses CPR dummies to suggest a type of adolescent male behavior in our digital age. In search of a stage for The Love Doll photographs, Simmons turned to her own home, transforming it into a shooting studio as well as an artful, color coordinated, oversized dollhouse. Simmons’ use of color photography and her obsession with light and pattern help her develop intimate and sometimes dreamlike scenarios with emotional impact. In both bodies of work, the paralyzingly larger-than-life realism Simmons offers is so palpable that the photographs merge with the viewer’s own space. In the sheen of skin in the dappled light, the viewer encounters details that expose and conceal the role of the camera. 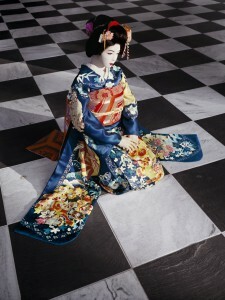 Laurie Simmons’ photographic works are in numerous public collections including the Metropolitan Museum of Art, Museum of Modern Art, Whitney Museum of American Art and Guggenheim Museum in New York, as well as the Museum of Contemporary Art, Los Angeles; Walker Art Center, Minneapolis and the Hara Museum, Tokyo. Laurie Simmons: Two Boys and The Love Doll was organized for the Contemporary Art Museum St. Louis by Chief Curator Jeffrey Uslip. The exhibition was generously supported by Salon94, New York. The exhibition is organized for the Sarah Moody Gallery of Art by Gallery Director William Dooley. Funding support for this exhibition comes from the Farley Moody Galbraith Endowed Exhibition Fund. Laurie Simmons, The Love Doll/Day 32 (Blue Geisha, Black & White Room), 2011, pigment print 70 x 47 inches. Image courtesy the artist and Salon 94, New York. *** Photographs by Laurie Simmons may not be cropped. Text overlays on top of or behind images not permitted. Funding support for the Sarah Moody Gallery of Art comes from the Department of Art and Art History and the College of Arts and Sciences. Admission to the gallery is free. Hours are Monday through Friday 9:00 – 4:30 p.m., Thursday evenings: 5:00 – 8:00 p.m. The gallery is located at 103 Garland Hall in the heart of the UA campus on Woods Quad. Information about visitor parking is available here: http://bamaparking.ua.edu/visitor-information/. Parking is free on campus in a legal space after business hours. Contact the gallery at (205) 348-1891 or go to http://art.ua.edu/gallery/smga/.